The American Revolution was saturated with meaning and ambiguity, from the words of the Declaration of Independence, to the beliefs of the founding fathers, to the vagueness, hedges, and contradictions of the Constitution on which the possibility of union between slave and free states rested. Ken and John examine the personalities, philosophies, and documents of the American Revolution with Pulitzer Prize winning Stanford historian Jack Rakove, author of Revolutionaries: A New History of the Invention of America. 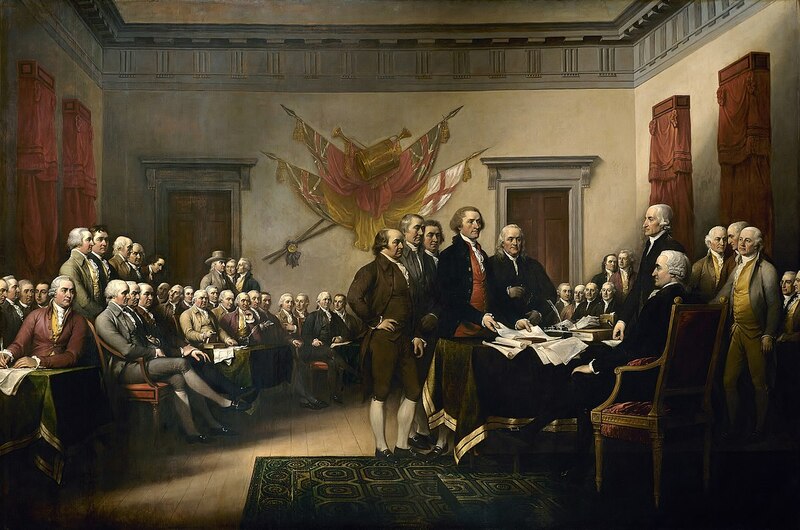 Key documents from the American Revolution, in particular the Declaration of Independence and the Constitution, are taken to provide the moral foundations for the U.S. political system. But it’s not always clear what the Founding Fathers meant. For example, “God” is mentioned twice in the Constitution—does that mean the U.S. was supposed to be a Christian nation? Both philosophers worry that ambiguities in language might make interpretation incredibly complex. Pulitzer Prize-winning historian Jack Rakove joins the conversation. Does the Constitution claim (as some would have it) that we are supposed to be nation based on free enterprise? Jack points to the Constitution’s commerce clause and emphasizes that the answer to this question depends on how we define “commerce.” Ken suggests that even if the Constitution places constraints on what the government can do, the Founding Fathers must have intended to leave many decisions up to the deliberations of the people. Jack agrees. Does it make sense to say whether the Founding Fathers had free enterprise in mind as the right economic system for the U.S., since they couldn’t have considered alternatives such as communism and socialism? Jack tells us that the Founding Fathers thought that private individuals should initiate most economic activity, but early on the national government did undertake to organize corporations and other economic projects. Were the Founding Fathers mostly practical thinkers or were they also interested in philosophical questions about government and ethics? Jack tells us that they had a deep understanding of the history of political philosophy. The hosts then receive a radical question via email: why should we be concerned with the Founding Fathers at all? Wasn’t the Constitution just an early, imperfect attempt at giving our government its proper foundation? Ken reminds us that the Constitution was not a soaring declaration of moral principle, but an urgent attempt to found a nation. A caller wonders whether family values are mentioned in the Constitution. They are not, but that is no accident, replies Jack. The Founding Fathers intended for familial issues to be a matter of state law. In fact, they put very few constraints on state powers. One notable exception is that states are not permitted to limit free conscience or the free exercise of religion. The three professors conclude by discussing the relationship between the Revolution documents and the values that are distinctive of American culture today. Roving Philosophical Report (Seek to 5:58): Angela Kilduff speaks with members of the Tea Party about the goals and ideals guiding the movement. America prides itself on being the oldest continuous democracy in the world. But criticisms of the America system are widespread. Our system is tailored to narrow interests and wealthy elites. Ellis, Joseph J. (2002). Founding Brothers: The Revolutionary Generation. Foley, Elizabeth Price (2012). The Tea Party: Three Principles. Formisan, Ronald P. (2012). The Tea Party: A Brief History. McClanahan, Brian (2012). The Founding Fathers Guide to the Constitution. Meacham, Jon (2007). American Gospel: God, the Founding Fathers, and the Making of a Nation. Rakove, Jack (1996). Original Meanings: Politics and Ideas in the Making of the Constitution. Rakove, Jack (2010). Revolutionaries: A New History of the Invention of America. Roberts, Cokie (2004). Founding Mothers: The Women who Raised our Nation. Levinson, Sanford (2012). “Our Imbecilic Constitution.” The New York Times. Paine, Thomas (1776). Common Sense. Waluchow, Wil. “Constitutionalism” (2007). The Stanford Encyclopedia of Philosophy. Bok, Hilary. “Baron de Montesquieu, Charles-Louis de Secondat” (2010). The Stanford Encyclopedia of Philosophy.